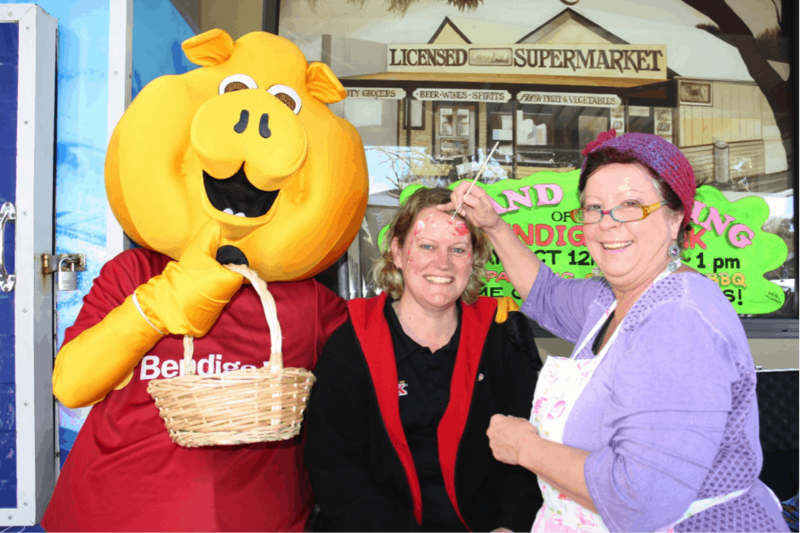 • Loving it: from left, Piggy, IGA manager Caelene Shervell and face painter Karen Dedretti. MEENIYAN celebrated last Friday, with the opening of a Bendigo Bank outlet at the IGA Supermarket. It’s been a long time coming, with many a hurdle along the way. But for IGA manager Caelene Shervell, the bank partnership – complete with teller and happy customer service – is something special. The official opening was replete with sausage sizzlers, a face painter, school kids from Tarwin Valley Primary School and man-sized pig named ‘Piggy’. School teacher Kath Gilbert said Caelene was known for her community service in the town. “Caelene is one of supporters of the breakfast club at school. She sends along milk, and extra bread if we need it, and flour for pancakes. She always puts in a great community effort,” she said. “We’re feeding 50 kids a week, because of Caelene and other sponsors.” Caelene said the bank was another “iron in the fire” for an already busy person. “It’s all about the community, really. It’s taken a long time to get here, but we go here,” she said.